When you happen to have the world’s scrawniest wrists you get creative with mittens to keep the cold out. My Buffalo Gal mitts are wonderful and I love ’em dearly but they are a little loose around the wrist. If it’s cold outside and the snow is blowing (like it is now in Oklahoma) you don’t want cold wrists. So here you see my Lotus Mittens with a little something extra started. What’s that you ask? Extra needles? Why yes – there are a few extra needles. When I finished the cuff I decided to knit into one of the last rows on the non-public side to begin a facing for the cuff. Hopefully this will keep cold air from whipping up inside my mitts and chilling my hands. I don’t think I need to line the entire mitts – they’ll fit fine because although my hands are small they aren’t quite so skinny as the wrists (I have skinny ankles and ears too truth be told. The rest of me is normal – I swear). I’ll knit back down to the ribbing and attach the lining at that point. 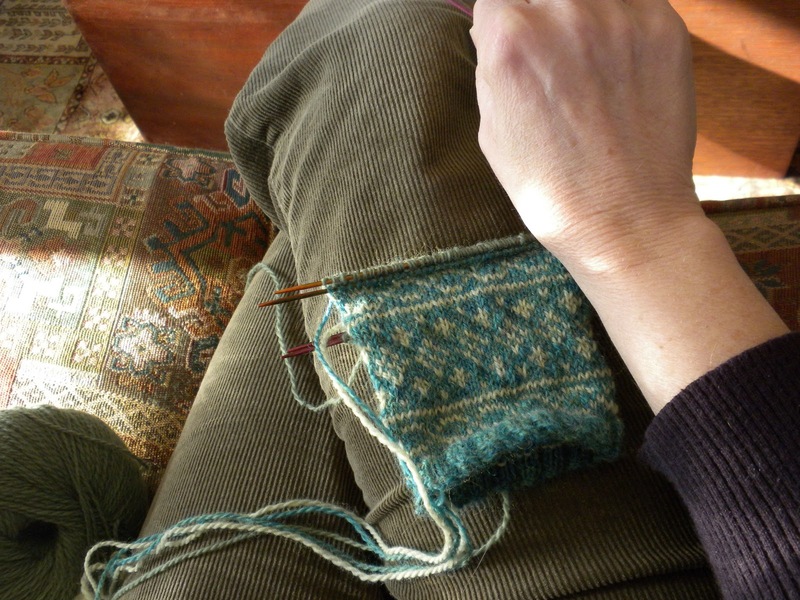 Then pick up where I left off at the top of the cuff and knit up the hand per the pattern. I know – it sounds a little crazy but having cold wrists just isn’t fun. I also made a little progress recently on the Cloisters Shawl. The first chart is finished and I’ve begun the second. I love how it’s looking so far. Incredible pattern – very fluid. Another hit from Mimknits. Since I'm another member of the Skinny Wrist/Ankle/Foot/Hand (but don't about Ear) Club, I'll be interested in knowing how these turn out. Your shawls are beautiful. I especially love the red Cloisters. 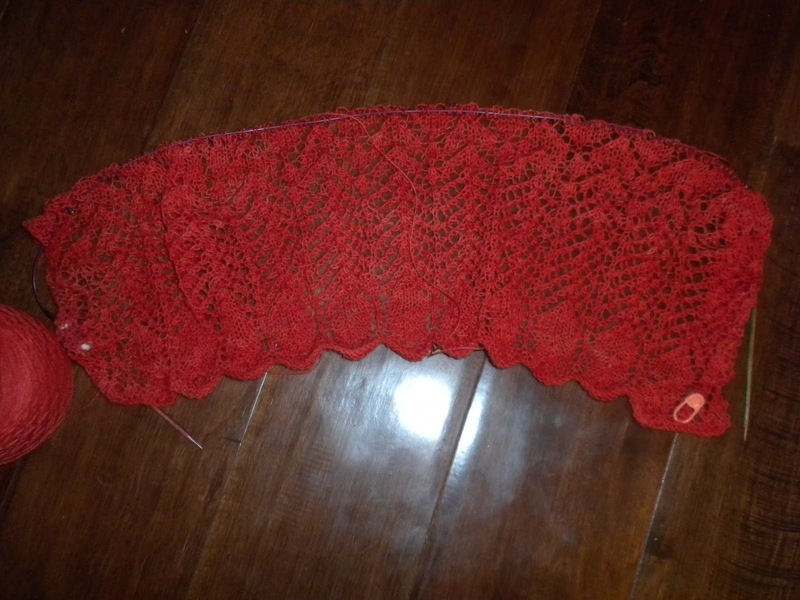 I've been toying with the idea of a red shawl lately. Laurie – I'm not really a “red” person but loved how the yarn looked when it came out of the dyepot. The next morning when I saw the skeins dry I KNEW I had to use one for Cloisters! Your Sangiovese Stole is gorgeous!